Had it not been for my efforts, Hill County would have had a dismal, unremarkable Centennial year. I wrote an article that was published almost daily in the Havre Daily News, about half-way through, I added an “Old Ad of the Week” featuring advertisements found in the old local newspapers, I opened my private home for house museum tours, organized a special Hill County Founders History Among the Headstones tour, and even hosted a Centennial birthday party at the Hill County Courthouse. I also put together several high tea and afternoon tea parties to celebrate the occasion. The first was held on June 10, 2012. The Hill County Centennial Celebration High Tea was a sold out crowd! Crab stuffed sow peas, cheddar stuffed mushrooms, butter crackers with cream cheese and homemade pepper jelly were the appetizers; creamy tomato dill with bread rolls and butter was the soup course; spring greens with Gorgonzola cheese and pistachios with hazelnut dressing served as the salad course; savory lemon chicken and saffron rice was the well-received entrée; and raspberry mousse capped off the five-course meal. Hill County’s history was infused throughout the evening, making the party locally meaningful. The event was a hit and served as the revival of tea party fundraisers in the Havre community, on up to and including my recipes and local history themes. When someone else steals your ideas, you know you’ve done it right and you’ve got a hit on your hands! 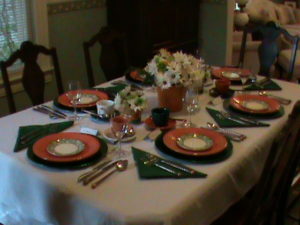 The table setting was inspired by the colors of the Clack Oil Company. H. Earl Clack owned several businesses in the area and was a successful businessman. I chose this theme because I had some mugs I thought would serve well as vases, and not to any family in particular. A white hemstitched linen-look table cloth was the base (Walmart). Fiesta Persimmon dinner plates (Boku Gifts, downtown Havre, no longer in business) were on green chargers (Walmart). A green transfer ware salad plate of unknown manufacture was used for appetizers (thrift store). Soup was served in alternating Fiesta White, Evergreen and Persimmon soup bowls (various locations). Salad was served on antique McNichol plates that were white with a double green band (thrift store). Tea cups were also alternating Fiesta White, Evergreen and Persimmon, and the flatware was a copper clad hammered set by Gibson and knives were by Chicago Cutlery ( both Herberger’s). Water was served in the simple crystal goblets made in West Germany (thrift store). Dessert was served in Depression glass green “orange segment” sherbets (rummage sale) on the Royal Crown Derby Titanic plates (ordered direct from the company in England) and flatware was my Golden Royal Plume set by William Rogers and Co. (antiques store purchase, Butte, Montana). Green “laurel” napkins were in a triangle fold (K-mart). Place cards with silver decoration rounded out the Montana theme of precious metal mining-gold, silver and copper were all on the table. The centerpiece consisted of an orange metal bucket with white daisies, orange Garbanza daisies, white carnations and lime green mums. Heccolene grease mugs (Clack Museum purchase) flanked the bucket and flowers echoed the metal bucket’s offerings. Please excuse the quality of the photograph! Hill County Centennial Celebration High Tea Party, June 10, 2012.